﻿This South Texas border town is rich in history and birding opportunities. ﻿Before the escalation of drug cartel violence made me think twice about visiting Nuevo Laredo, a border run to Laredo and its sister city across the Rio Grande always topped my annual “to-do” list. It’s been many years since my last visit to la frontera to sip authentic margaritas, shop for Mexican goods, eat mouth-watering Mexican fare and loll amid the tropical gardens by the La Posada Hotel pool. I decide that although visiting Nuevo Laredo still seems ill advised, a sojourn in Laredo might be the next best thing. Laredo shares a common heritage, culture, cuisine and natural world with its south-of-the-border neighbor. History tells us that Laredo, founded in 1755 by Capt. Don Tomas Sanchez, is the only remaining Spanish colonial settlement on the northern bank of the Rio Grande. Like Texas itself, Laredo (originally christened the “villa” of San Agus­tin de Laredo in 1767) once existed as a separate nation, albeit for only 283 days in 1840. I discover these fascinating facts while visiting the Republic of the Rio Grande Museum on Friday afternoon after my wife, Judy, and I check into the recently renovated La Posada Hotel, which occupies a prime downtown spot between the river and the nationally registered San Agustin Plaza. The museum, in the historic 1830s Garcia home next door to the hotel, has undergone restoration by the Webb County Heritage Founda­tion. Original cypress lintels over the doorways, majestic vigas (ceiling beams) and thick, plastered limestone walls transport visitors back to 19th century Mexico. ﻿Birding activity is picking up in Laredo. 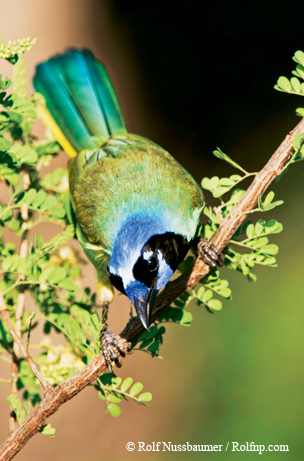 The green jay and other South Texas specialties attract visitors. A three-starred flag just inside the museum’s entrance attests to Laredo’s unique status as the only part of Texas to have existed under seven flags. Vintage photos and exhibits tell the story of how an army of federalists in the northern Mexican states, loyal to Mex­ico’s republican constitution of 1824, rose up against Santa Anna’s centralist government in Mexico City. 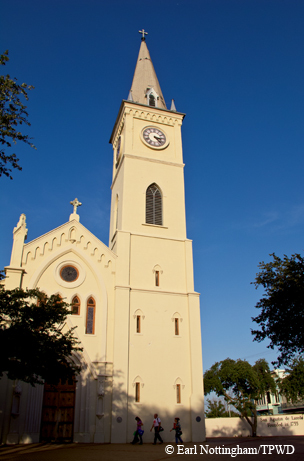 In January 1840, Laredo was proclaimed the upstart nation’s capital. The structure housing the museum is believed to have served as the seat of government. After a number of battles in northern Mexico towns, Antonio Canales’ federalist forces surrendered to Mexican centralist forces in Camargo, and the new republic ceased to exist. Laredo’s history reveals itself in the museum’s exhibits — from its early 18th century ranching days to the coming of the railroad in 1881 (making it a “gateway” city to Mexico) to the oil and gas boom of the early 20th century. The museum’s three-room wing offers a glimpse into 19th century border and South Texas ranching life. The officina de la hacienda (ranch office), recamara (bedroom) and cocina (kitchen) contain an impressive collection of antique ranching implements, furniture and other heirlooms. Two blocks farther down Zaragoza Street sits a two-story, red-brick, late 1920s-era building housing the Villa Antigua Border Heritage Museum. Also administered by the county heritage foundation, the museum, with wraparound porch and mosaic tile floor, hosts revolving border life exhibits. I am mesmerized by the “Houses of Yesterday” exhibit featuring photos of homes and buildings in Laredo and Nuevo Laredo, whose architectural styles mimic each other, lending more visual proof of Laredo’s dual heritage. ﻿﻿San Agustin Church provides a historic anchor for the city. With the late-afternoon sun painting the historic San Agustin Church and surrounding plaza in a golden light, a stroll around the busy square proves irresistible. I photograph the historic buildings and soak up the local ambiance of residents exchanging greetings and lounging on shaded park benches, as workers set up chairs at the gazebo for an evening wedding. There’s still time to see the George Washington Birthday Celebration Museum, which is located in part of La Posada’s sprawling complex. I’ve read about this seemingly incongruous celebration of our country’s first president in this Mexico-centric city and am curious about its origins. The hotel concierge unlocks the museum doors so I can read the exhibits and view the elegant, sequined costumes of former celebrators who reigned as George and Martha Wash­ington and the Indian princess Pocahontas. 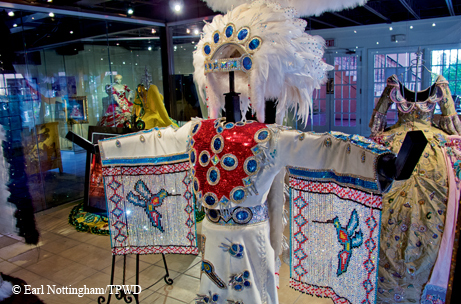 ﻿﻿Sequined costumes are on display at the George Washington Birthday Celebration Museum, documenting an unusual annual celebration. I won’t reveal the answer to what one museum placard notes is “one of the most-asked questions of why we celebrate George Washington’s birthday (Feb. 22) on the Texas border” except to say it’s worth a visit to learn that what began in 1898 as a two-day event has morphed into a four-week festival with dozens of events. Suffice it to say that what Mardi Gras is to New Orleans and Fiesta is to San Antonio, Washington’s Birthday Celebration is to Laredo. Next year will mark the popular festival’s 117th edition. La Posada’s Tack Room, Laredo’s 30-year dining institution, is a must for us during our stay. Located in the historic Bruni-Cantu building, the legendary, two-story restaurant with downstairs bar serves tasty steaks and seafood dishes prepared on an open copper and brass grill behind the salad bar. We find that the restaurant’s trademark beer cheese soup is no longer on the menu, but the chef takes pity on us, and soon two pewter bowls of the steaming and sinfully rich ambrosia appear. The next morning, biologist Tom Miller stands outside the Lamar Bruni Vergara Environmental Science Center, ready to lead a guided bird walk along the adjacent Paso del Indio Nature Trail in honor of Earth Day. Miller, president of the local Monte Mucho Audubon Society, is executive director of the science center on the Laredo Community College campus, which occupies the former Fort McIntosh (1849-1946). The center promotes environmental stewardship through hands-on educational programs, nature walks, a living laboratory, wetlands and tours of its native vegetation and riparian features. Indoor exhibits emphasize water conservation — a critical concern in this growing, drought-prone city of almost 300,000, where getting enough fresh water from the Rio Grande and other sources proves a constant challenge. Miller tells me that Laredo, unlike other downriver Rio Grande Valley municipalities, came late to the nature tourism table but is making up for lost time. Blessed with a mix of brush and desert country, as well as riverine and riparian habitat, Laredo attracts an intriguing mix of bird species, many of them migrants from Mexico and Central America. The city’s premier birding hotspots show up in birding guides and on the Texas Parks and Wildlife Department’s Heart of Texas Wildlife Trail and Great Texas Coastal Birding Trail maps. In 2010, the first U.S. sighting of an Amazon kingfisher at Zacate Creek drew more than 1,000 birders from throughout the country. 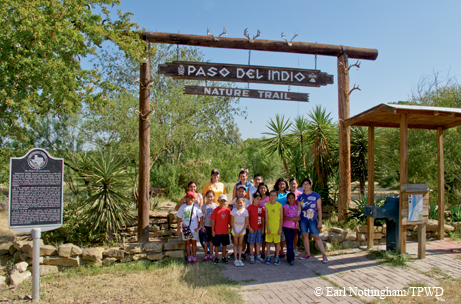 ﻿﻿Schoolchildren embark on a guided hike at the Paso del Indio Nature Trail along the Rio Grande. During my visit, Laredo was hosting a meeting of the Texas Ornithological Society. The city’s three-day Laredo Birding Festival in February attracts birders drawn by such indigenous specialty birds as the green jay, great kiskadee, white-collared seedeater, clay-colored thrush and red-billed pigeon. Our 90-minute hike along the roughly two miles of trails that hug the wooded banks of the Rio Grande between the border fence and the river brings us several noteworthy sightings: a great kiskadee, green jay, Couch’s kingbird, chipping sparrow, cormorant and black-bellied whistling duck. Our last day calls for a visit to Lake Casa Blanca International State Park. Opened as a state park in 1991, the 371-acre former county park attracts roughly 200,000 visitors annually. Many come from Mexico, which lies only 10 miles away. Because the 1,600-acre lake, fed by three creeks, is the only substantial water body for recreational pursuits within an hour’s drive of Laredo, the park draws hordes of campers, anglers, boaters, swimmers and picnickers. Sunday family barbecues are a tradition here. Park ranger Holly Reinhard, a recent arrival in Laredo, takes time out from her preparations for a Camping 101 workshop to share all that Lake Casa Blanca has to offer and to explain why folks visiting Laredo should add a park visit to their itineraries. An avid birder, Reinhard has documented more than 100 species since her arrival, including a recently spotted scaled quail, a first for the park. She directs us to a prime birding spot — a freshwater pond and palm grove on Ranchito Road. On the way, we pass tennis courts, basketball courts, a baseball field, children’s playground, group camping facilities and one of four day-use areas. Reaching the pond, we are rewarded with sightings of a number of water birds, including a tricolored heron, my first. We return to the park’s east side, where several families have already encamped for the day and are enjoying a splash in the designated swimming area. At the boat ramp, we meet kayak bass fisherman Bobby Gonzalez, who works at a nearby branch of Texas A&M University and frequents Lake Casa Blanca. He sings the lake’s bass fishing praises and shoves off with multiple fishing poles in his kayak. We spy in the distance what looks like an old Spanish mission with a bell tower atop a nearby hill, so we decide to investigate. I learn that the abandoned park structure once housed a science center. Once again, Laredo’s bicultural identity asserts itself in what once was part of Mexico. We vow to not wait so long to revisit one of Texas’ most intriguing “international” destinations again.